Google Sheets version of my spreadsheet is finished! I just finished porting my spreadsheet into Google sheets. It retains full functionality with automatic price data. I have also updated the Jewelcrafting part of both versions of my spreadsheet. It now includes direct profit calculations of all the major crafts: Rare gem cuts, rings and epic gems. The newest version of my Excel sheet is always available at through my spreadsheet page. The spreadsheet should be fairly self-explanatory in terms of the information that is shown for each profession. It currently contains Enchanting, Jewelcrafting and Leatherworking. My end goal is to have it include all professions, but it is quite a bit of work to add recipes so it will be a long term project. The spreadsheet contains one worksheet for each profession, one sheet for Blood of Sargeras and one sheet where the data is downloaded. The worksheets will show you the profits from all recipes and profit from disenchanting or obliterating where appropriate. The spreadsheet will help you easily figure out which crafts from the professions are worthwhile. For Jewelcrafting it also calculates the expected value from prospecting both Leystone and Felslate, as well as the best possible use of your gems. Before filling it out you need to make your own copy in your Google Drive. To do this just click File and then “Make a copy”. It should add a version to your Google drive instantly. To set it up you need you TSM API key. 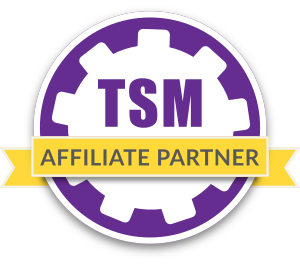 You find it at www.tradeskillmaster.com/user If you are not a registered TSM user you will have to register to get access to the API. The API key should be pasted into cell marked in blue. To update the data just change the value in the red cell to anything new. IT updates the data every time the value in this cell is changed, so use it accordingly. Keep in mind that you are capped at 10 requests per day to the TSM API so don’t do it to much or you will run out of updates. In addition to porting the spreadsheet to Google Sheets I added some functionality to the Jewelcrafting sheet. It now includes profit calculations for all the crafts that are included. I also fixed some smaller mistakes on the back end of the crafting calculations to more accurately reflect the value of Blood of Sargeras from disenchanting. These fixes have been added to both versions of the spreadsheet so play around with them as you want. 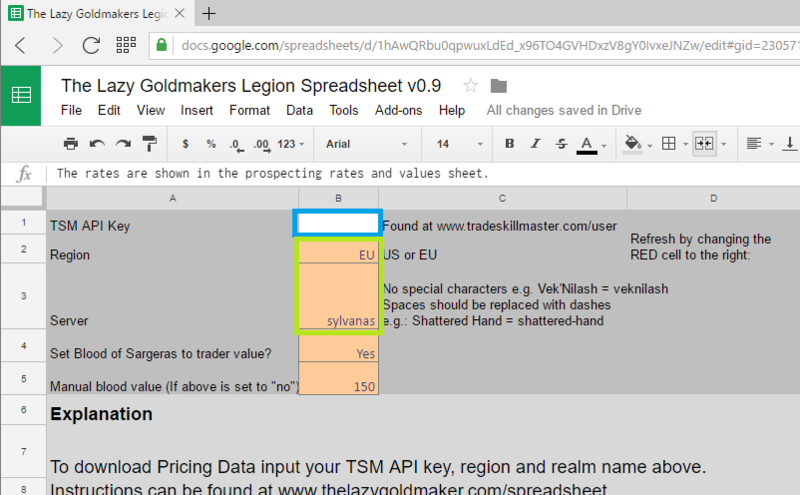 I hope you enjoy the new version, I’m really happy that the TSM API was updated so that I can much more easily implement it into google spreadsheets. If you have any requests for what to add next to my spreadsheet please tell me, I aim to help you guys the best way I can! Simple Gold Tips 3: Making gold with Hexweave Bags! Hello! I am loving this spreadsheet, thanks so much for all the work you’ve done. I was wondering if you are planning on adding Tailoring to this any time soon? I tried to create my own based off the leatherworking tab, but its a bit over my head. Thanks for your feedback. Tailoring is next on my list of professions. 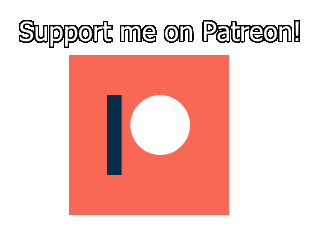 I will be starting it this week, but it takes a while to model up all the recipes so I don’t have a definite time frame yet. I will be keeping you posted! The API should be working again now. What sort of problem are you having? I’d need a bit more context to help you. Seems like you misspelled draenor as dreanor . Try changing that and you should be good! Hmmm changed it even a few times. So there are problems curently. Hello. Just started looking at your spreadsheet. Thanks for the hard work. On the Jewelcrafting sheet, it lists Felslate with green background, and Leystone with no background. Does that mean anything? Under the Expected profit/ore and Expected return on investment sections, can you explain what the data is telling me in the Best Method and Selling Raw sections? The color of the felslate and leystone background does not mean anything specific. For the Best Method and selling raw sections the numbers represent the expected profit per ore from prospecting and then either selling the gems raw or using them for crafting in the best possible way, which is shown below with the “best method” column for the various gems. Ok thank you. One additional question. In your spreadsheet it says: Craft Prophecy Band. Does that mean craft Prophetic Band? Prophetic Band also has its own row. Yes it is on everything doublechecked the realm and api key. I got on your discord and read that there may be an issue with Google calling the api too many times. Btw love your work and all you do for us aspiring goblins.